At Cupertino’s “Spring Forward” event, we finally found out what the Apple Watch is going to cost, and when it will be available. The Sport edition will start at $349 for the 38mm version and $399 for the larger 42mm edition. The Apple Watch model, with its stainless steel case and sapphire display cover, will range from $549 to $1,049 for the 38mm version and from $599 to $1,099 for the 42mm watch. The prices will depend on the band you select. And finally, the high-end Apple Edition model starts at a whopping $10,000. These will only be available at select retailers. Are these price points in line with the rumors? Yes, although that probably hasn’t stopped many from scratching their heads on the starting price for the Edition models. And up to $1,099 for the sapphire crystal version? A bitter pill for many to swallow, perhaps. 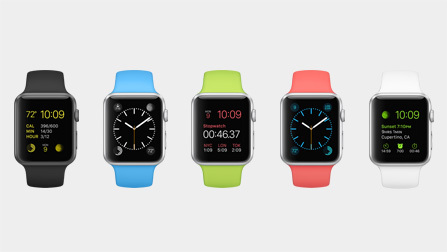 Preorders for the Apple Watch begin on April 10. 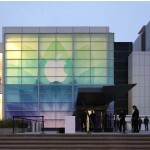 This is also the day Apple retail stores will begin offering Watches for shoppers to try on. The Watch will ship on April 24 in Australia, Canada, China, France, Germany, Hong Kong, Japan, the United Kingdom, and the United States. The device will arrive elsewhere in the coming months. During the event, Apple wasn’t enormously specific about the battery life on the company’s newest product, although we did hear more about some of its features. Apple CEO Tim Cook would only say that users can expect around 18 hours of battery life on the Watch for a “typical day.” He also demonstrated the magnetic charging system and provided the media with a recap of Digital Touch, the smart, new way Watch owners can communicate with one another. With Digital Touch, owners can use their finger to draw on their Watch’s screen and have this doodle beam over to a friend. The animations will disappear a few seconds after it appears on-screen. Watch owners can also take advantage of the device’s Taptic Engine to get the attention of a fellow Watch owner. Simply tapping on your Watch’s screen will see your friend’s Watch gently vibrate, and they’ll know you need them. Finally, Watch owners can send their heartbeat to another user of the device. Cook added, “I’m hoping someone sends me one of those” after discussing the feature on stage. 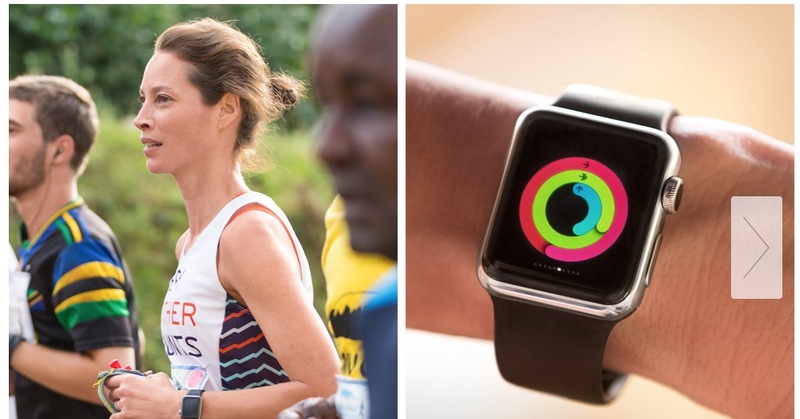 In order to show the effectiveness of the health and fitness apps for the Apple Watch, Christy Turlington Burns participated as a guest speaker at the event. During the event, the Watch measured her distance, pace, and heart rate. 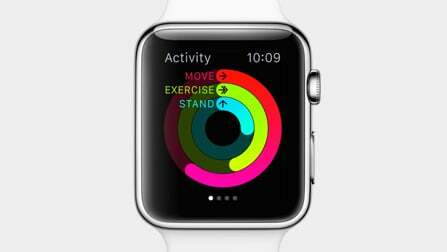 Apple’s Kevin Lynch also detailed other ways that users can interact with the Watch. He talked with Siri regarding the weather report and reminders. He also showed off the WeChat app for the Watch, which features a number of stickers and quick suggestions to message friends and family. The Instagram app for the Watch was also shown for the first time. Users can use the digital crown to quickly scroll through images on their feed and like those posted by others. Lynch also showed the Uber app in action. 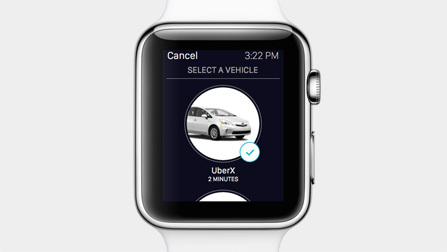 It will tap you on the wrist when the Uber car is near and the notification will show the car type, license plate, and driver information. 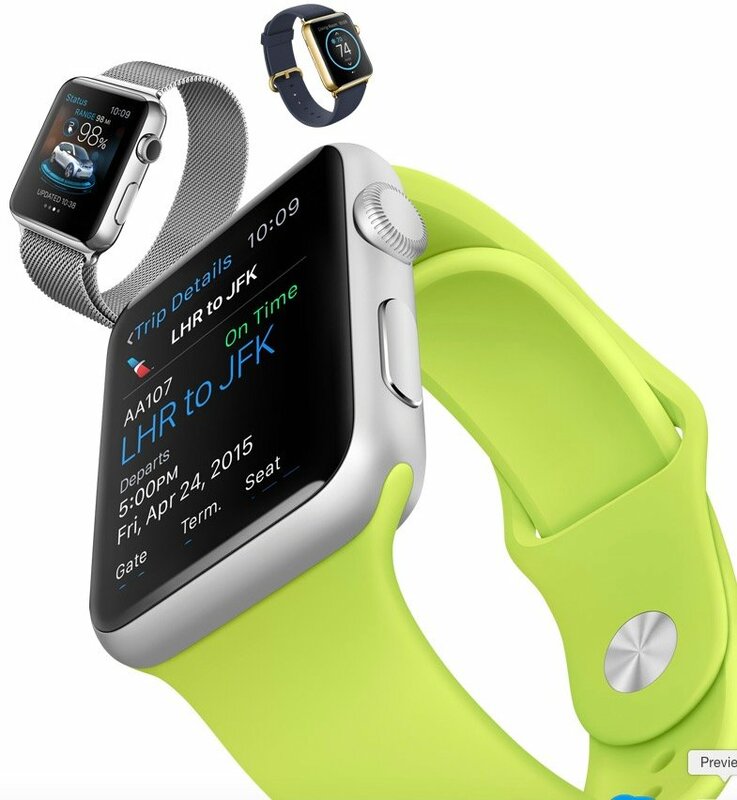 With Passbook, you can quickly and easily show a boarding pass directly from the watch’s face. 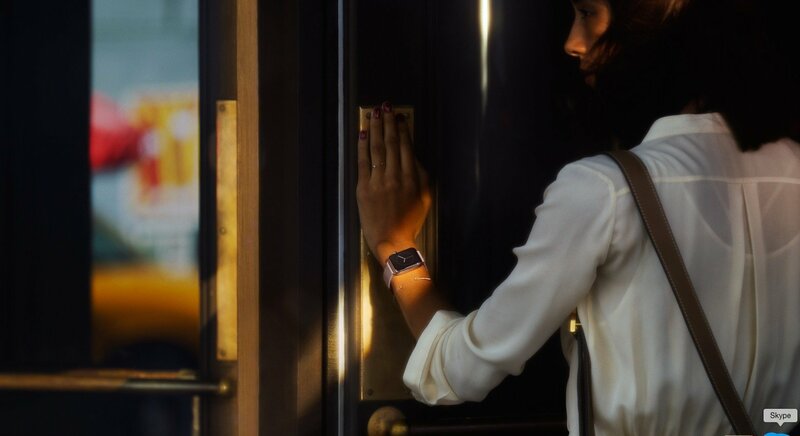 And using the SPG app, users can bypass the front desk completely and simply unlock their hotel room’s door with the watch. Using an Alarm.com app, a watch owner can open their garage door and view a live video feed. Finally, Lynch demonstrated the use of the Apple Watch to use Apple Pay. When you put your watch next to the scanner, it quickly dings and gives you haptic feedback on your wrist so you know the transaction is done. 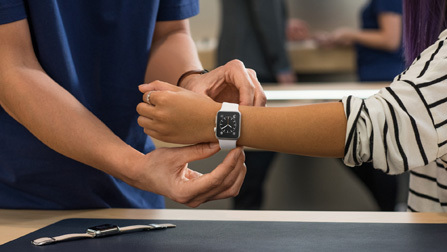 For a full list of Apple Watch apps, click here. 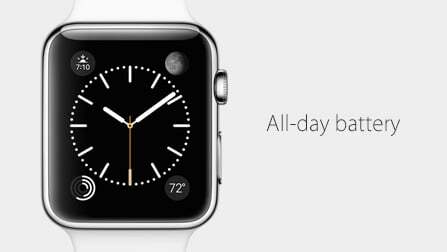 We’re going to have a lot more to say about the Apple Watch as we get closer to its April 24 release. We hope that you can join us. 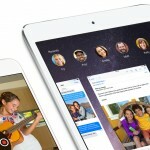 In the meantime, see: Apple introduces ResearchKit to improve and expand medical data collection for research, Apple unveils a new, thinner 12-inch MacBook, and HBO Now launching exclusively on Apple TV.